12"H Oak 6 Drawer Pedestal - with 6 drawers. Create function where none existed before Under bed storage systems are the ultimate addition to any bedroom Also available in 9" and 14" . Pedestal does not feature a hard top. Decking is required. Northern Red Oak • Slower growing cycles create a dense grain for a much harder wood, providing decades of durability & beauty. 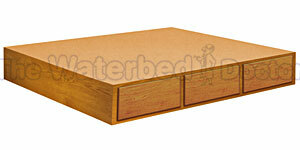 Solid Oak & Oak Plywood • Prevents swelling, lifting or delaminating for long life. 7-Ply Baltic Birch Drawers •"Old-World" craftsmanship to ensure drawer durability and mayn years of use. Hand Sanded • Timeless beauty and lasting design, with the personal touch of the individual wood working professional to assure fnal quality. Solid Wood Framing • Creates stability and offers perfect grain and stain match with beds and other casepieces. 5 Side Drawer Box • Designed to endure sustained use for many years, this design has long been recognized as the ultimate in durability. Dual Euro Enamel Coated Glides • Engineered to last a lifetime and operate smoothly and trouble free. 9 Custom Finishes Available • Coordinates with virtually all bed styles, these pedestals can be added at any time.